A novel coating that repels almost every type of liquid and solid — from blood and crude oil, to ice and bacteria — has received a 2012 R&D 100 Award from R&D Magazine. The annual awards honor the 100 most technologically significant products of the previous year. The winning technology, called SLIPS (Slippery Liquid-Infused Porous Surfaces), was developed by a team of scientists from the Wyss Institute for Biologically Inspired Engineering at Harvard University and from Harvard’s School of Engineering and Applied Sciences (SEAS). The R&D 100 Awards have long been a benchmark of excellence for diverse industry sectors. Since their inception in 1963, the awards have identified many promising technologies that have gone on to become household names. These game-changers include the flashcube (1965), the automated teller machine (1973), the fax machine (1975), the Nicoderm anti-smoking patch (1992), lab on a chip (1996), and HDTV (1998). SLIPS was inspired by the slippery surface of the carnivorous pitcher plant, which enables the plant to capture insects. The technology was first described in the September 22, 2011 issue of the journal Nature. Joanna Aizenberg, a Wyss Core Faculty Member and the Amy Smith Berylson Professor of Materials Science at SEAS, is leading the research effort with support from Wyss Postdoctoral Fellow Tak-Sing Wong. SLIPS is a novel coating that repels almost every type of liquid and solid — from blood and crude oil, to ice and bacteria. 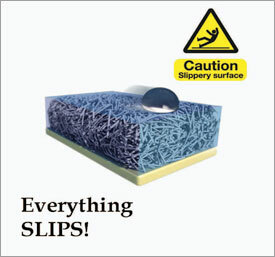 The novel super slippery surfaces can quickly repel liquids and solids, and their complex mixtures. The surfaces show a unique ability to self-repair if damaged and to self-clean. The technology is effective in a range of harsh conditions, such as high pressure, extreme UV exposure, high acidity, and freezing temperatures, and SLIPS can be created on almost any surface, including glass, plastics, and metals. The coating itself is non-toxic and anti-corrosive. SLIPS technology has the potential for high-impact applications in numerous areas, including biomedical fluid handling, fuel transport, and anti-fouling and anti-icing approaches. For example, SLIPS could prevent biofilm from forming on medical devices and keep ice from forming on railings, roofs, wires, signs, and airplane wings. Winners of the R&D 100 Awards are selected by an independent judging panel and by the editors of R&D Magazine, which covers cutting-edge technologies and innovations for research scientists, engineers, and technical experts around the world. The winners will be recognized at the R&D 100 Awards Banquet in November 2012.